Caesarstone alternatives for the kitchen and bathroom? Hoping someone can suggest some potential alternatives for kitchen and bathroom bench tops. Our preferred product is Caesarstone due to the feel and look of it, but we haven't been able to find quite the colour we're looking for in their range.... I'd really like to explore something similar from another company maybe? So far a search has turned up Quantum Quartz but I'm wondering if there are others. There are lots of different manufacturers of reconstituted stone products, so google search for reconstituted stone, rather than Caesarstone, which is the market leader and a brand name. Make your selections from seeing real samples in your home, as images off the internet are deceptive for colour accuracy. 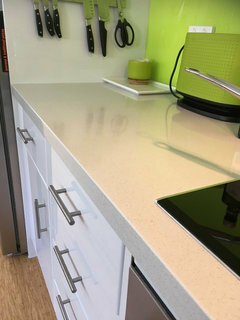 I like Caesarstone as it feels like stone, whereas some of the competitors feel more like plastic. 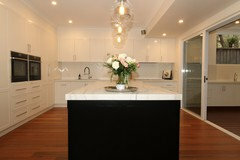 A lot of the costs to reconstituted stone benchtops comes down to the labour content for installation. For instance I had a client who was shocked that her Caesaerstone laundry benchtop was so expensive, until I explained to her about the manual labour needed to finish off the edging for the hole for her undermount sink and her benchtop edge detail. Hi Alex & Christie, you may like to search "Reconstituted Stone" which is what this type of product is called. 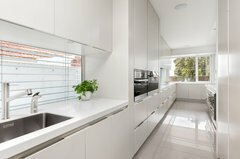 In addition to Caesarstone & Quantum there is also Essastone, Silestone, Stone Italiana and Smartstone. All of these feel and sound like stone. We have a small section on our website about the various properties of Reconstituted Stone if this is any help. If you are looking for something different to the manmade Reconstituted Stone products but want the feel of stone, you may also like to look through the range of real Natural Granites and other Stone available. Wholesalers CDK Stone have a good site to help give an idea of what's available, though these slabs are all best seen in real life. Thanks so much for the replies - This is really helpful. I'll try searching using those keywords instead to find some showrooms around Sydney that we can visit. Thanks again! 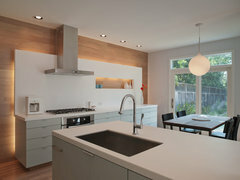 There are many different brands of manufactured stone, another option that hasn't been mentioned yet is SileStone, they have quite a few more colours than Caesarstone so if you're not finding a colour you like with them, SileStone or like mentioned above, Quantum Quartz could be good brands to look into. Essatone recommended not to use. I’m using quantum quartz. On choice quantum and Caesar stone were on par. 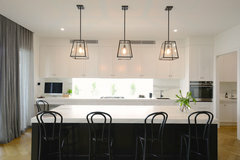 If you are in Sydney, perhaps check out the stone benchtop options at Bunnings. 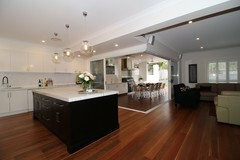 I have a beautiful kitchen from Bunnings, and the priciest item was definitely the benchtop, but well worth the cost. Essential Stone was the provider, and my bench top was made on the Central Coast. there are three levels of quality and one is sure to meet your budget. Mine was in the mid-range and it is stunningly beautiful, they did an outstanding job at installation and I couldn't be happier with it. Jodie Louise - Why don't you recommend essastone?? I am looking at using the ash concrete and the unique calacatta but am finding it hard to get any info or reviews on them anywhere. Did you see that combination at the Hive? That’s exactly what I was going to do. BUT I asked two stonemasons if they would price the work for my kitchen and they said they wouldn’t use the stone for one and two they have stopped working with Essastone due to the quality. After hearing that I got turned off it. MrsRicho Call a Stonemason and ask there preference on stone and what they recommend. I presume not a lot of people know of Essatone I believe its a branch of Laminex Group laminates. What’s the hive? I haven’t seen it anywhere just liked the Honed feel of the calacatta and the colour of the concrete. I’ll call. Stonemason and check. Thanks so much. Plush Design Interiors...not heatproof though is it , which means it shouldnt be mentioned as any sort of alternative in this story..
Caesarstone on shower walls instead of tiles?